LaHood: "We now have proof that Toyota failed to live up to its legal obligations." WASHINGTON (Bloomberg) -- Toyota Motor Corp. “knowingly hid a dangerous defect” that caused its vehicles to accelerate unexpectedly, the U.S. said, for the first time accusing the world's largest automaker of breaking the law. 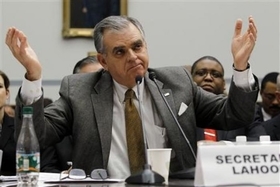 Transportation Secretary Ray LaHood proposed a record civil penalty of $16.4 million, the most the government can impose. The fine recommended Monday escalates the confrontation between Toyota and LaHood, who initially praised the carmaker for its handling of recalls the company attributed to faulty accelerator pedals. The fine was announced the week after Toyota reported U.S. sales rose 41 percent in March with the help of no-interest loans and discount leases, signaling the company may be recovering from recalls of about more than 8 million vehicles worldwide -- including 1,687,000 in Europe -- for flaws that may cause unintended acceleration.. The Japanese automaker waited at least four months before telling the agency that accelerator pedals might stick, LaHood said in a statement. Companies have five business days to report safety defects, the agency said. Toyota hadn't received NHTSA's letter on the fine, according to an e-mailed statement Monday from the company's North American sales unit. “We have already taken a number of important steps to improve our communications with regulators and customers on safety-related matters as part of our strengthened overall commitment to quality assurance,” the company said, without saying whether it will exercise its right to dispute the fine. Toyota in January recalled about 2.3 million U.S. cars and trucks for sticky accelerator pedals. The recall for Europe started in February. The penalty could “very possibly” be the first of multiple fines, said Claybrook, who is former president of Public Citizen, a Washington-based consumer advocacy group. NHTSA cited documents obtained from Toyota in saying the company knew about the pedal defect since at least Sept. 29. At a February congressional hearing, Toyota's U.S. sales chief Jim Lentz told lawmakers “we failed to promptly analyze and respond to information emerging from Europe and in the United States” about the sticky pedals. Toyota has two weeks to accept or contest the proposed fine, Olivia Alair, a Transportation Department spokeswoman, said in an e-mail. If Toyota contests the penalty and a settlement isn't reached, “it would go to court,” she said. NHTSA's largest civil penalty was $1 million against General Motors in 2004 to settle charges that the company failed to conduct a timely recall involving windshield-wiper failures in about 581,000 vehicles. “Both industry and government failed the test of putting the safety of America's drivers first” in the Toyota recalls, Representative Darrell Issa, the top Republican on the House Oversight and Government Reform Committee, one of three panels that has held hearings on Toyota actions, said in a statement Monday. The proposed NHTSA fine may help consumers suing Toyota over sudden acceleration, said Houston attorney W. Mark Lanier, who has filed class-action and individual lawsuits related to the claims. “Toyota is spending millions of dollars on public relations right now to sway consumers or a potential jury pool,” Lanier said in a phone interview. The fine “is free publicity that counters Toyota.” The penalty probably couldn't be introduced in court because “it's not like a criminal finding in that there was due process,” he said. Toyota is facing at least 177 consumer and shareholder lawsuits seeking class-action status and at least 56 suits claiming personal injuries or deaths caused by sudden acceleration incidents, according to data compiled by Bloomberg. Lanier has filed two personal injury cases and is considering filing about 100 others, including a dozen involving deaths, he said.